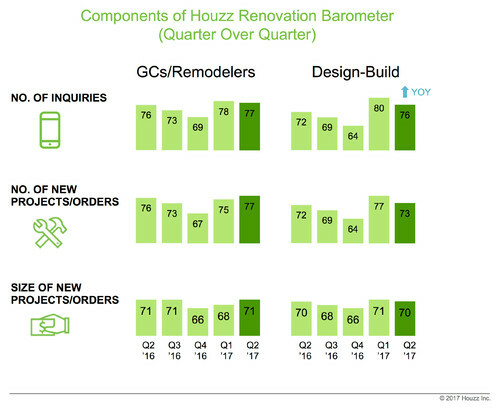 Renovation professionals continued to feel confident about the market for their services during the second quarter of 2017, according to the latest Houzz Renovation Barometer report, released today. The quarterly index tracks optimism among architects, designers, general contractors and remodelers, design-build firms, building and renovation specialty firms, and landscape and outdoor specialty firms. Confidence scores remain fairly stable relative to the first quarter of 2017. The biggest jump was among landscape and outdoor specialty firms — to be expected, as outdoor projects typically pick up during the spring and summer. Read on for more insights into how business is going for six sectors of the renovation market. Architects and designers feel confident. 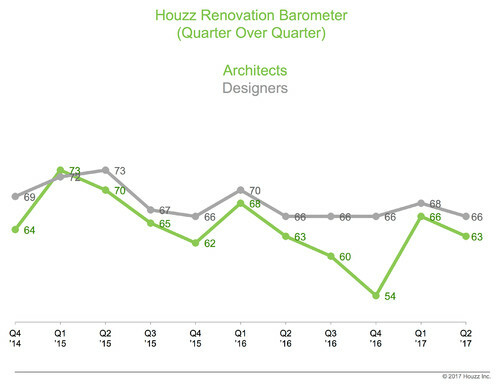 The barometer reading for architects was 63 during the second quarter, while designers scored 66 — both indicate high confidence in the market. The scores were the same a year ago. The barometer is an index designed to measure business sentiment. Scores over 50 indicate that there are more firms reporting higher business activity compared with the previous quarter than firms reporting lower activity. The higher the number over 50, the greater the proportion of firms reporting quarterly increases in business activity rather than decreases. Scores for contractors, remodelers and design-build firms remain steady. 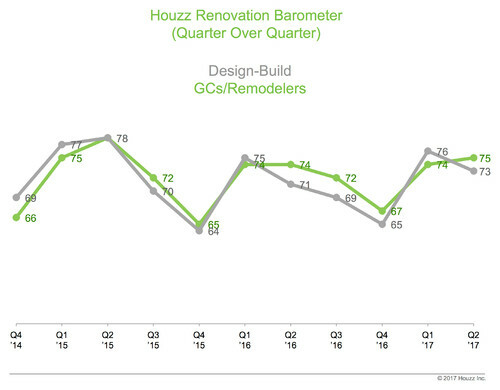 General contractors and remodeling firms scored a second-quarter barometer reading of 75, while design-build firms came in at 73. These scores indicate strong optimism among these sectors during the second quarter of this year, and the readings are in line with those for the same period in 2016. On a regional basis, the readings for design-build firms rose year over year in both the South and the West. Landscape and outdoor specialty firms are most optimistic overall. Landscape and outdoor specialty firms received the highest Q2 barometer score of all the professional sectors surveyed: an impressive 78. That reflects a notable rise after a weakened score during the first quarter of 2017. Landscape and outdoor specialty firms include landscape architects, designers and contractors; outdoor replacement trades such as pavers; and outdoor product installers, manufacturers and resellers of items such as pools and spas. Meanwhile, building and renovation specialty companies also had a high score for the second quarter: 73. Building and renovation specialty firms include replacement contractors (for example, carpenters) and product installers, manufacturers and resellers (of cabinetry, for example). For both of these sectors, the scores during the second quarter of 2017 are in line with those for the same period one year earlier. Score for size of architects’ new projects levels off. 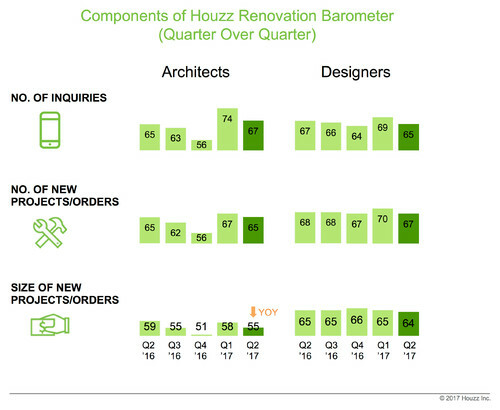 This chart shows the components of the Houzz Renovation Barometer: number of inquiries, number of new projects or orders, and size of new projects or orders. A reading over 50 indicates that there are more firms reporting that business activity is higher in these specific areas than firms reporting it is lower, relative to the previous quarter. These scores are for architects and designers. As the chart shows, the barometer reading for the size of architects’ new projects or orders is lower year over year, though it’s still above 50. In other words, there are still more firms reporting an increase in the size of new projects than there are firms reporting a decrease, but the trend is not as pronounced as it was one year ago. Design-build firms’ score for new inquiries is up. On a year-over-year basis, the score for the number of inquiries among design-build firms jumped by four points. The scores for both design-build firms and general contractors and remodelers are holding strong — in the 70s for both company types across all three components of the barometer. Outdoor firms’ score for new inquiries dips slightly. On a year-over-year basis, the score representing the number of inquiries made to landscape and outdoor specialty firms took a small (three-point) downturn. 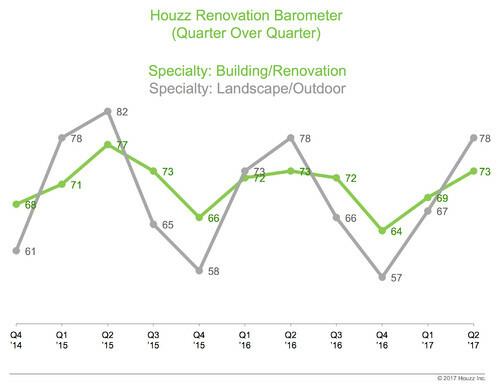 But with scores in the high 60s and 70s across all components of the barometer, readings remain strong for both building and renovation specialty firms and landscape and outdoor specialty firms. 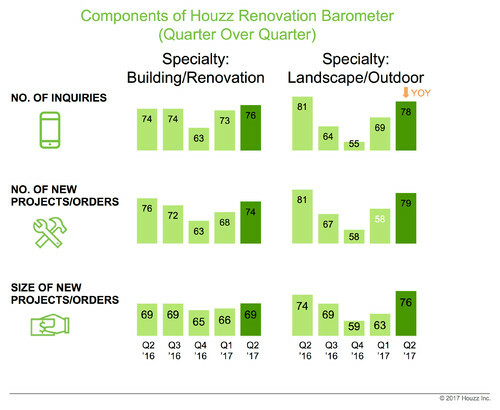 The Houzz Renovation Barometer survey was fielded June 27 to July 10, 2017, and responses were received from 2,408 professionals.